This building on Bergen Street between New York and Brooklyn avenues in Crown Heights will become a shelter for 106 homeless men later this month, the city said. 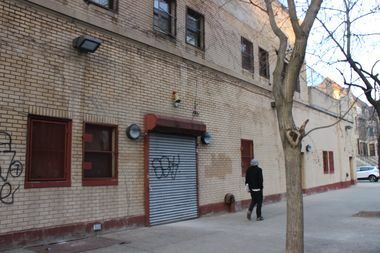 CROWN HEIGHTS — A homeless shelter slated to open on Bergen Street in March will only cater to older men in response to neighborhood criticism that younger men cause more problems and the neighborhood already has too many shelters. CORE Services originally said the new shelter at 1173 Bergen St. would house single men 50 years old and up and provide employment services and job training help on site, but following a raucous public meeting about the shelter on Saturday, the operator increased the age requirement to 62, Shalawn Langhorne, first vice chair of Brooklyn Community Board 8, said Thursday. The shelter will also focus less on employment services, she said. Many concerns from residents near the shelter, slated to open March 22, had to do with “safety, loitering and community impact,” Langhorne said. “The belief that led to the increase in the age of the men is that older men cause fewer issues within the system and have a negligible impact on the day-to-day lives of the community,” she said. CORE Services declined to comment Friday. At a town hall meeting in Bedford-Stuyvesant also Thursday night, Mayor Bill de Blasio also announced the change, while emphasizing that the city plans to close three shelter facilities in the area while opening the Bergen Street shelter, all part of an overhaul of the Department of Homeless Services announced last week. Of the nearly 60,000 people who use city shelters, about 6 percent are single men, according to DHS statistics. A second public meeting about 1173 Bergen St. is set for Tuesday, March 14 at 6:30 p.m. at the Uncommon Charter High School, located at 1485 Pacific St. in Crown Heights.